Democrat Nancy Pelosi currently represents Congressional District 12. Pelosi is expected to easily win re-election in 2016. For 27 years, Nancy Pelosi has represented California's 12th District in the House of Representatives. 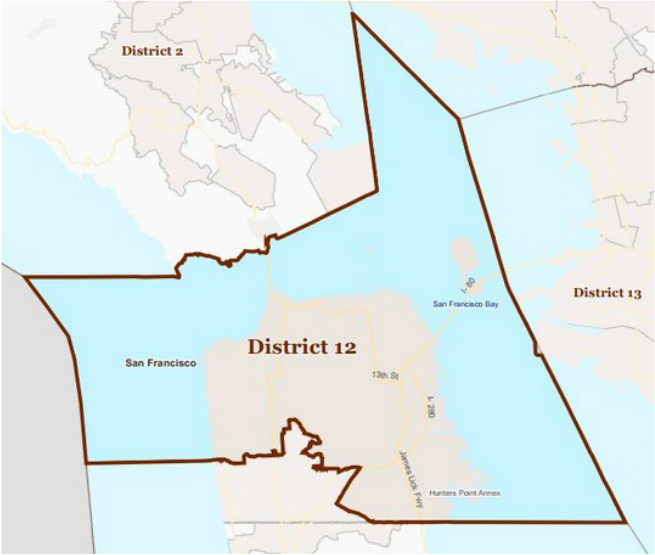 The 12th District includes most of the City of San Francisco Bayview, Chinatown, the Mission, North Beach, Presidio, SOMA, the Sunset and many of the diverse neighborhoods that make San Francisco a vibrant and prosperous community. Working in partnership with President Obama, Pelosi led the House effort to pass the American Recovery and Reinvestment Act in early 2009 to create and save millions of American jobs, provide relief for American families, and provide a tax cut to 95 percent of working Americans. With the House Democratic Caucus, Pelosi continues to focus on the need to create jobs in America and prevent them from being shipped overseas. Pelosi spearheaded passage of historic health insurance reform legislation in the House which establishes a Patients’ Bill of Rights and will provide insurance for 30 million more Americans while lowering health care costs over the long term. The new law provides patients with affordable insurance choices, curbs abuses by the insurance industry, strengthens Medicare, and will reduce the deficit by more than $100 billion over the next 10 years. In the 111th Congress, Pelosi also led the Congress in passing strong Wall Street reforms to rein in big banks and protect consumers as well as the Student Aid and Fiscal Responsibility Act, which expands educational opportunities and reforms the financial aid system to save billions of taxpayers’ dollars. Additional key legislation passed into law included the Lilly Ledbetter Fair Pay Act to restore the ability of women and all workers to access our judicial system to fight pay discrimination; legislation to provide health care for 11 million American children; national service legislation; and hate crimes legislation. In late 2010, Pelosi led the Congress in passing child nutrition and food safety legislation as well as repealing the discriminatory “Don’t Ask, Don’t Tell” policy, which prohibited gays and lesbians from serving openly in the military. In continuing to push for accountability and transparency in government, under Speaker Pelosi, the House passed the toughest ethics reform legislation in the history of the Congress, including the creation of an independent ethics panel, and increased accountability and transparency in House operations, including earmark reforms. As Speaker, Pelosi led the fight to pass the DISCLOSE Act in the House, which fights a corporate takeover of U.S. elections and ensures additional disclosure. Additional key accomplishments signed into law under the leadership of Speaker Pelosi include: an increase in the minimum wage for the first time in 10 years; the largest college aid expansion since the GI bill; and a new GI education bill for veterans of the Iraq and Afghanistan wars; and increased services for veterans, caregivers, and the Veterans Administration. In meetings around the world with U.S. and foreign intelligence leaders, Pelosi has urged greater attention to the threats to international security posed by the proliferation of technologies associated with weapons of mass destruction and global terrorism. A leader on the environment at home and abroad, Pelosi secured passage of a provision in the International Development and Finance Act of 1989 which requires the World Bank and all the regional multilateral development banks to review the potential environmental impacts of development projects for which they provide funding and to make these environmental assessments publicly available. Known as the "Pelosi Amendment," it has become a significant tool for indigenous peoples and nongovernmental organizations around the world. Pelosi graduated from Trinity College in Washington, D.C. in 1962. Pelosi and her husband, Paul Pelosi, a native of San Francisco, have five children and nine grandchildren.